From April 13 to April 22 I toured Costa Rica with Amazing Journeys. This is my third trip with Amazing Journeys. I had such a good time on the previous journeys I figured why not continue the trend. 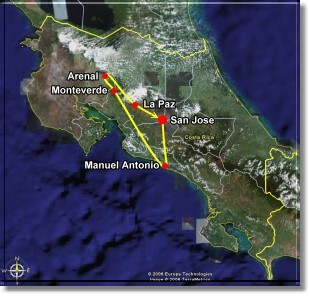 Our destinations in Costa Rica were San Jose, Manuel Antonio, Monteverde, Arenal, and La Paz. While on our amazing Costa Rican adventure we saw three different species of monkeys, two and three toed sloths in their natural habitat, iguanas, coatis, and much more. We also experienced the thrill of soaring high above the jungle on a zip wire, white water rafting, rappelling down waterfalls, and enjoying a scenic mountain biking tour or hike alongside a volcano and relaxing in great swimming pools and hot springs.